Simplification is an important chapter in Arithmetic as well as in competitive exam. So, every competitive exam generally asks two or more questions from the simplification aptitude. It has a very good value for a competitive exam. So, we should give much effort as we can. Because there are several maths tricks have to use to solve problems from the chapter Simplification. Sometimes, we use BODMAS rules, Algebra formula or mental math concept to be a quick solution for simplification aptitude problem. Here, we will discuss all the math tricks one by one. When you will see any question like below then use this formula, use all operation sequentially. 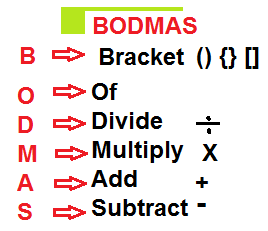 Above, simplification aptitude and solution, we take the few simple questions to apply BODMAS rules. We need to practice exam level simplification aptitude, we discussed in solved aptitude section. 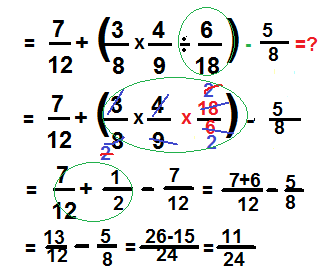 By the way, you can use this formula also in the simplification problem of the fractional numbers. 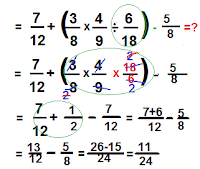 Here, we are going to solve some simplification aptitude on fractional numbers. What do you think friends? Above aptitudes are not like exam level? Yes, friends, it's not really exam level simplification math problems. 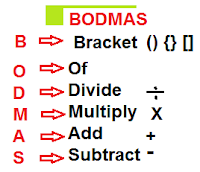 Just we used the BODMAS formula and learn how to apply BODMAS rules to solve Simplification aptitude. For Exam level Simplification aptitude question and quick solution click below.